While there are many birds that have naturally evolved to be flightless, there’s only one kind of bird humans have selectively bred until it no longer possesses an ability shared by most of its kin- the parlor roller. Nobody knows when exactly the parlor roller was first bred into existence. 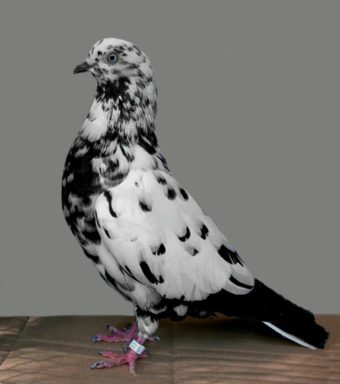 However, the breed, which is ultimately a descendant of the rock pigeon, may go back as far as the mid-19th century, with the bird’s origins being traced to Scotland. More recently than its rock pigeon ancestry, the parlor roller is a more extreme offshoot of another breed of pigeon called the parlor tumbler, which is similarly known for its acrobatic prowess. However, a key difference is that parlor tumblers, as their name suggests, tumble through the air as they fly instead of rolling across the ground. No one would ever have thought of teaching, or probably could have taught, the tumbler-pigeon to tumble, – an action which, as I have witnessed, is performed by young birds that have never seen a pigeon tumble. We may believe that some one pigeon showed a slight tendency to this strange habit, and that long-continued selection of the best individuals in successive generations made tumblers what they now are; and near Glasgow there are house-tumblers, as I hear from Mr Brent, which cannot fly eighteen inches high without going head over heels. As noted by Darwin, tumbler pigeons seem to have been artificially brought into this world by selectively breeding pigeons who exhibited a specific behaviour (in this case, rolling over for no particular reason) over many generations until the behaviour became ingrained and exaggerated to an almost comical degree. Darwin himself, at least judging by this quote, probably never saw a parlor roller, because he describes a bird that could still fly at least a little off the ground, though perhaps it was these low flying parlor tumblers he heard about that ultimately were bred into the parlor rollers. In any event, because they’re only selectively bred for their ability to roll, color is largely unimportant when it comes to parlor rollers and as a result, the birds come in a vast array of colorations, from pure white to the traditional iridescent coat of a common pigeon. In fact, potential purchasers of these birds will quickly find that the breeders typically price them based on how far the bird can roll at a time before stopping- the farther they can go in more or less a straight line, the higher the price. If you’re curious, the current world record for distance for a parlor roller continuously backflipping is 662 feet and 3 inches (201.85 meters), though a typical competition sees the winning birds roll more in the range of approximately 50-80 feet (~15 to 25 meters). Due to the fact they can’t fly, parlor rollers are ideal pets for people living in apartments and the bird can happily be kept in a rabbit hutch, though you have to keep its food and water on the floor. Wow! I’m reading about the Parlor Roller bird for the first time today. Though, I have encountered a number of similar birds in my home country, but I like the interesting facts about this Parlor Roller. Seriously, nature is just awesome. A good read indeed. Thanks! They are bred to have seizures. It’s about the most unethical example of pigeon breeding imaginable. Pigeons are too good for people.